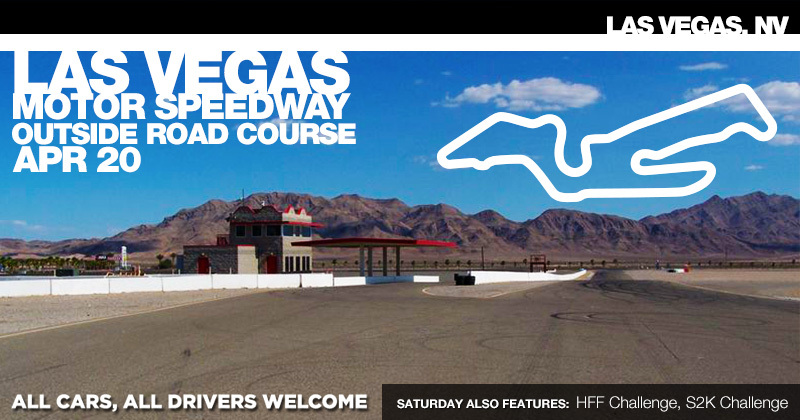 You've got one shot this year to enjoy the Outside Road Course at Las Vegas Motor Speedway, and next Saturday is it. Don't miss our sort-of-becoming-annual one-day party in Vegas on the 20th. As you can see from the track map below, the course offers an interesting mix. And as luck would have it there are 13 corners. Register now and start looking forward to a day at the track and a night in Sin City. This event also features competition in the HFF Challenge and Rockstar Garage S2K Challenge. Have a great week and we'll see the weekend of the 20th! CLICK HERE TO REGISTER: Las Vegas Motor Speedway, APR 20, 2019. SINCE 2001, Speed Ventures has organized track events at the best road-racing tracks in California and Nevada and in the process, introduced thousands of drivers to the sport of road-racing. We welcome experienced drivers and racers looking for a place to practice, test and compete and we offer orientation and instruction for beginners. Speed Ventures offers private events and run groups, time trials & competition, autocross, media days and more. With just a helmet and the stock safety equipment that came with your car (see our FAQ), you can explore your car's performance potential and build your skills in a safe, controlled environment. With events roughly every other weekend, we make it easy to get out and drive as fast as you want. S2K Challenge, Corvette Challenge, HFF Challenge, Bimmer Challenge, 86 Cup, and Cadillac Challenge. SUPERMIATA for race-prepped Miata wheel-to-wheel action. SPEC CORVETTE for C5-generation Corvette racing. In addition to the competitions, Speed Ventures also conducts a uniquely structured high-performance driving school environment that's available on many popular and challenging race tracks in California and Nevada. With a home base in the greater Los Angeles metropolitan area in Southern California, Speed Ventures can provide on-track performance driving instruction in the vehicle that you know best - your own! Above everything else our mission is safety so our instructors teach you at your pace on any number of popular race tracks in the area; car control, racing etiquette, the proper race line, safely determining the physical limits of your vehicle and more. For those looking to live the ultimate dream of driving a true sports car on a real race track, we also offer vehicle rentals for instruction or for a day of behind-the-wheel fun in a safe and controlled environment. For more information on high-performance driving instruction, racing competitions, sponsored track days, and everything else Speed Ventures offers, please contact us.